Amana washers and dryers come in various styles, colors and sizes and can be purchased online or in many department, appliance or home retail stores. The washing machines are available in both top and front-loading models with options such as vibration control and various wash, rinse and spin cycles. The dryers range from basic temperature and fabric options to models with electronic controls and variable sensor controls. Troubleshooting Amana washers and dryers may help users resolve potential problems without needing to contact Amana for assistance. Adjust and tighten the feet on the washing machine if the unit is rocking or vibrating. If the unit is set on a pedestal, ensure the washing machine is firmly secured to the pedestal. 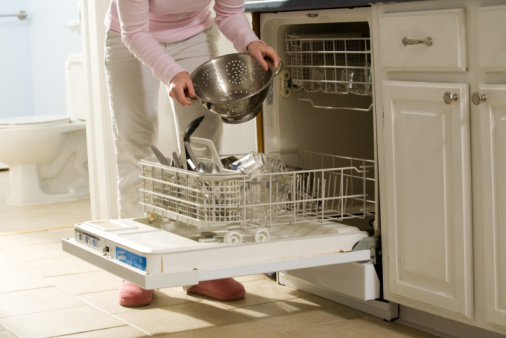 Add a piece of ¾-inch plywood under the washing machine if the floor does not seem sturdy enough to support the weight of the washer. Turn off the washing machine and look inside the door gasket as well as inside the drum for objects if there is an unusual rattling noise during use. Check pockets for objects and remove items prior to setting clothing in the washing machine. Tighten both ends of the fill hoses if there is leaking. Ensure the drain hose is secured to a laundry tub or drainpipe and clear the sink or drain. Clean the inlet screens on the hoses if the problem continues and clear away any debris. Verify that the detergent was placed in the correct dispenser compartment if the detergent, fabric softener or bleach is not dispensing as expected. Clean out the dispenser drawer and dry with a towel to prevent clogs. Do not place color-safe bleach in the chlorine bleach dispenser. Color-safe bleach should be added directly into the washing machine basket. Count the number of flashes if there are error codes flashing on the display. The light will flash several times before pausing. Count the number of flashes before the pause and the number of flashes after the pause. For example, if it flashes 8 times and then 1 time, this is an "F8E1" error code. Write down the error code, press "Power" to cancel the cycle and turn off and unplug the washing machine. Restore power and start a new wash cycle. If the error code repeats, contact Amana for assistance. Use a volt meter to check the power supply at the outlet if the dryer is not operating. Dryers use at least 240 volts and need at least two household fuses or circuit breakers. Reset or replace the circuit breaker or fuse as needed. Press and hold the "Start" button for five seconds if a large load was placed in the dryer and it is not starting. Ensure the door is closed firmly. Separate the items inside the dryer if the dryer is rattling or thumping during use. Tighten the legs and ensure all four legs touch the ground. Examine the drum edges and seals for objects that may have gotten caught in the machine if the drum is not turning or there is a rattling sound during use. Contact Amana for assistance if the "WET" indicator light is flashing with a pause between flashes. This indicates a service problem that needs assistance.